Credit cards are powerful financial tools, but also require a lot of responsibility. After all, they are often a key credit-building block for consumers, even though you don’t technically need a credit card to build credit (thanks Dave Ramsey). For this reason, and many others, it’s important to manage your credit card(s) sensibly, making on-time payments and keeping balances low. Sure, everyone knows that missing a credit card payment is bad, and will result in a late fee and a sizable credit score ding. 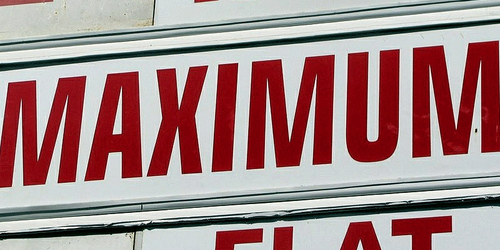 But what about maxing out a credit card? How bad is that? Is it just a slap on the wrist, or is it more? While it may seem like a negligible offense, maxing out a credit card (or two) is a serious misstep in the eyes of FICO, the magicians behind the ever-important FICO score. While there’s no clear number of points your FICO score will drop as a result of a maxed out balance, the message is clear: Your score will go down, noticeably. As always, the impact will depend on a number of things. First, where was your FICO score to begin with? The higher it starts, the further it falls. If it’s already depressed, the impact will be less. Additionally, if you always carry high balances on your credit cards, the credit score impact will already be factored in, so again, a smaller drop. Conversely, if you’re the type that always keeps credit card balances low, and one day maxes out a card or two as a result of an emergency, your credit score will take a big hit. 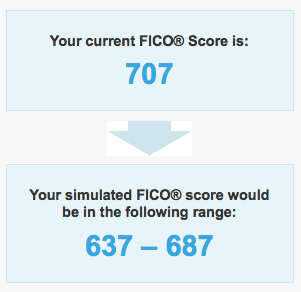 I did a little research and found a FICO score simulation that showed a 707 FICO score dropping to 637-687 as a result of ALL credit cards being maxed out. In another FICO study, their example revealed an 80-point drop after maxing out two credit cards, sending the consumer’s score from 780 to 700. In fact, in that second example, the credit score impact was nearly as bad as the late payment example, which sunk the score 100 points. Why Maxing Out Is Bad? When it comes down to it, maxing out a credit card (or any line of credit for that matter) is bad news because it signals serious financial distress. It’s a warning to creditors that you’re at risk of falling behind, or on the brink of missing a payment. Along with that, you no longer have access to credit on that credit card, so how will you make your purchases going forward? Will you max out another credit card instead and compound your already dire situation? A maxed out credit card balance will also require a higher minimum monthly payment, meaning you could be in even more danger of missing a payment. Or not being able to come up with the full amount. The good news is that maxed out credit cards aren’t the end of the world, and are by no means permanent black marks on your credit history. As long as you’re able to pay down the balances, your credit score will rise again. Yes, it will take time, but it’s certainly reversible. This differs from actual missed payments, which stay on your credit report for years, even if the account is now in good standing. At the end of the day, it’s important to keep your credit utilization low, as it’s one of the many factors that go into FICO scoring. So be mindful of your balances, not just your payment due date. It could save your credit score. Tip: How much does a missed credit card payment lower your credit score? I’ve experienced this firsthand. I maxed out a credit card a month ago and my credit score has fallen 60 points. Gotta pay it off so my score gets back to normal. Previous Previous post: Are You a FICO Score High Achiever?